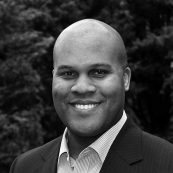 Founder and CEO, Symphonic Strategies Inc.
Dr. Alonford James Robinson Jr. is the Founder and CEO of Symphonic Strategies™ Inc., a research, training, and consulting firm that specializes in solving collective action challenges. Symphonic Strategies™ works with people from all walks of life to help them lead and transform the organizations and communities around them. Dr. Robinson leads a team of diverse and gifted individuals who specialize incapacity building, monitoring and evaluation, instructional design, and organizational learning. Dr. Robinson began his career as a global faculty member for the Corporate Executive Board (CEB), a leading international business strategy firm. While at CEB, Dr. Robinson delivered keynote remarks and led organizational strategy seminars with C-level audiences in more than 150 organizations throughout Europe and North America. His areas of expertise include corporate strategy, marketing, and human resource management. After nearly a decade at CEB, Dr. Robinson left to become a senior strategist and advisor to the Children’s Defense Fund. He spent two years in that role, building the organization’s national infrastructure, modernizing its communications platform, and building multi-sector partnerships and coalitions. Over the course of his career, Dr. Robinson has been a consultant to the PBS show Frontline, served as a staff writer on the Encarta Africana Encyclopedia of the Black Diaspora, and was a member of the Heinz Endowments’ African American Men and Boys Advisory Board and the Open Society Foundation’s Leadership and Sustainability Working Group. In addition to his consulting work, Dr. Robinson delivers regular seminars and courses to public sector leaders in federal, municipal, and local government agencies. He currently spends a portion of his time as an adjunct professor at the Center for Excellence in Public Leadership (CEPL) at George Washington University and a lecturer in the Customs and Border Protection Leadership Institute with the Robert H. Smith School of Business at the University of Maryland. His courses and seminars include topics that range from strategic management, organizational transformation, executive decision-making, and leading change initiatives. Dr. Robinson holds a Ph.D. in Government from Harvard University and dual bachelor’s degrees in social psychology and political science from Stanford University.